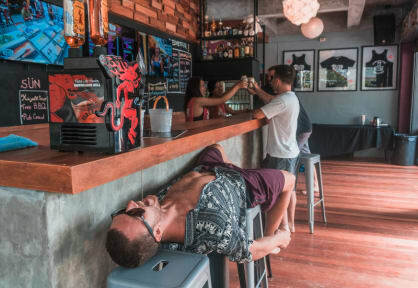 Definitely the best hostel in Krabi if you are looking for a fun time! The staff are a blast, the booze cruise they offer is the most fun I've had so far in Thailand. They really look out for you here. Especially Mikey, who ran the booze cruise, made sure we all had a great time on and off the boat! Would stay here again! Medewerkers (Pinkie) waren erg helpvol en meedenkend. Verder was het een groot feest. I choosed to party and that happend! The facilities are also very clean, no mosquitos, warm showers etc etc. Kikiiii is awesome btw! and owye that south african girl is great to^^ There is a missing thing: chilling chairs, you cant really hang somewhere uhuhh. Yes they try to sell you tours, but on the otherhand tours are more fun if EVERYone is joining so I understand that part. had an amazing time and felt very welcome by the staff, props to them for being the kindest staff i've ever met! Very Nice hostel, good party’s, great staff (also proper englisch speakers so thats a plus). If you want to party, or play a lot of beerpong you have to Go There! This hostel was super fun to stay at! The staff was super helpful. They had fun events and especially the pubcrawl was wicked! If you are up for a party and love to meet new people; this is the place to be! We only stayed for 2 nights but had so much fun! The staff is super friendly and helpful! Overall a good experience! Just be sure you can handle a little less comfort (toilets and showers that aren’t super clean) and want a lot of fun and nightlife instead!